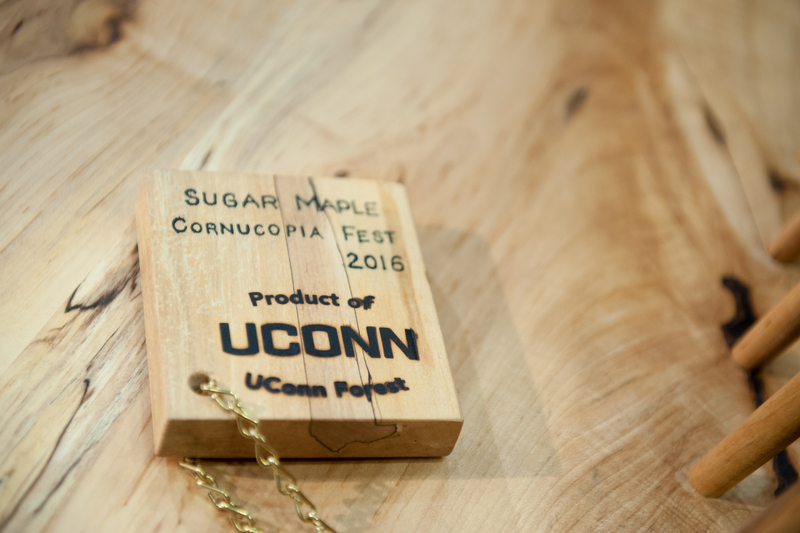 Sometime early in 2016 a sugar maple tree died somewhere on campus and was removed by the UConn arborist crew. Knowing that our UConn student Forest Crew runs a portable bandsaw mill on occasion, arborist John Kehoe arranged to have some of the larger logs from the tree dropped off at the wood yard, thinking they might be of interest. The logs remained there on the ground throughout the summer while the Forest Crew worked on other projects. Now, some sawyers will tell you that making the first cut into a sawlog can be like opening a gift package – sometimes you find something special – and such was the case here. The maple lumber from this not-so-special log exhibited some very interesting figure and color and a bit of “spalting” (a black meandering line that can be seen in spots), all characteristics that are prized and valued by woodworkers. The lumber was stored away in the shed to wait for some special purpose to present itself (or, perhaps, for some wealthy wood-working customer to come along). When Dean Weidemann announced his retirement and with that announcement came the topic of a recognition gift, the question arose as to whether something could be made from “UConn wood”, and lo and behold, a special purpose presented itself. So pieces of the Cornucopia-fest maple were loaded onto the old Ford pickup and delivered to the artisans and craftsmen at City Bench, in Higganum. 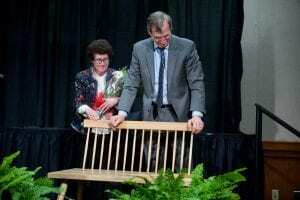 There they were kiln-dried, planed, turned, book-matched and assembled into the bench we are proud to present today. The “Product of UConn Forest” and “Connecticut Grown” brands provide recognition that raw materials in this item were locally grown and produced following sustainable forest management practices. Thanksgiving is right around the corner. Did you know that you can buy a Connecticut grown turkey? 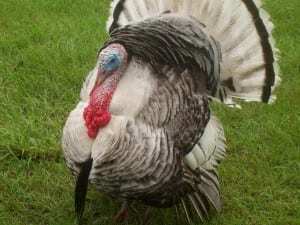 Check out the Buy CT Grown guide to Connecticut turkeys. Even if you don’t eat a Connecticut grown turkey, there are lots of great suggestions for how to add some local flavor to your holiday meal. Check out the recipes for sweet corn casserole and pumpkin muffins at the bottom of the page. The Live Local! App invites consumers to discover and experience Connecticut’s local food and agriculture. Take the pledge to spend ten percent of your food and gardening dollars on locally grown products. Poinsettias are ready to ship at greenhouses across Connecticut! As you prepare for the holiday season, make sure to support local agricultural businesses. The origins of the American Thanksgiving celebration can be debated. For early settlers, the occasion was often religious in nature, offering thanksgiving and praise for many blessings, not just a bountiful harvest. But, traditionally, we are taught that the Pilgrims celebrated the first Thanksgiving Day in 1621, following their first harvest in the New World. Accounts indicate that this was a three day feast, attended by both the new world settlers and Native Americans, who shared what they had produced as well. In 1863, Thanksgiving was given national holiday status in a proclamation by Abraham Lincoln, to be celebrated on the final Thursday in November. While it has come to mean many things (football, the beginning of the holiday shopping season, etc. ), the holiday continues to be a celebration that is centered on bringing family and friends together for a large meal, often at least partially based on that 1621 Pilgrim feast. One thing we know for sure…the meal shared by the Pilgrims and the Native Americans was locally grown! It might have included turkey, but definitely duck, goose, or even pigeon and venison; shellfish, including lobster, oysters, mussels and clams, smoked fish; corn porridge made from Indian corn; chestnuts and walnuts; and pumpkins and squashes. Potatoes and cranberries had not arrived yet: and if they had pumpkin, there was no pie, as flour was not available. They might have had some fresh vegetables, but in November they were likely limited to onions, beans, cabbage, and carrots. Chances are, they meal was composed to a large extent of meat, fish, and fowl and more meat, fish and fowl. So, since we, too, are located in proximity to the first northeastern settlers, why not be true to tradition (at least a little bit! 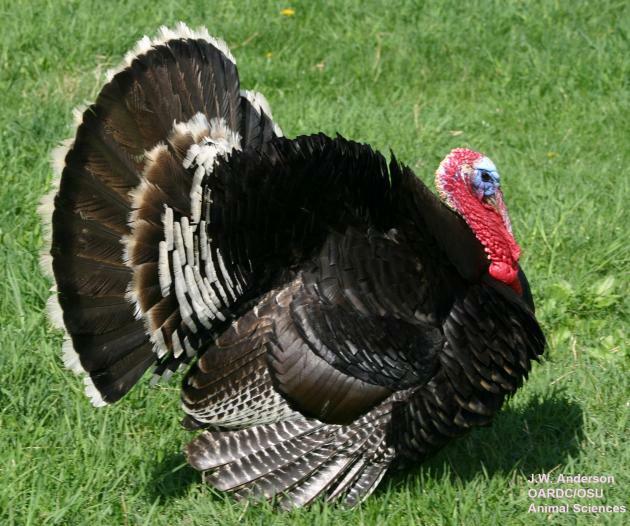 ), and try for a Thanksgiving feast composed of food grown and/or processed in Connecticut. It can be done pretty easily with just a little effort. First, consider what produce is seasonally available. The Crop Availability Calendar located on the Connecticut Department of Agriculture (DoAg) web site (go to www.ct.gov/doag and click on “Where to find Connecticut Grown Products”), indicates that in November, apples, carrots, greens, mushrooms, onions, pears, potatoes, turnips and winter squashes (including pumpkin, acorn, butternut, and others) are available. Find these fruits and veggies at a farmer’s market or local farm stand near you. Occasionally you may be able to find local products at your larger grocery store as well, but support your farmer at the source. There are over a hundred farm stores in Connecticut. A listing by county can be found on the DoAg website as well. Farmer’s markets are beginning to wind down for the season, but many remain open until Thanksgiving, selling the very produce listed above. At least 10 on the DoAg listing remain open until November 22, with a handful holding on until late December. Some might think, “OK, that’s the easy part, what about the turkey?” Just as you can buy local produce, in our state, it is possible to support local producers of turkey and other fowl, shellfish from our waters and, perhaps, if you are a hunter (or, at least good friend with one), add venison to the mix. Actually, finding locally grown poultry might be easier than you think, though the trick is ordering your bird before they are all spoken for. 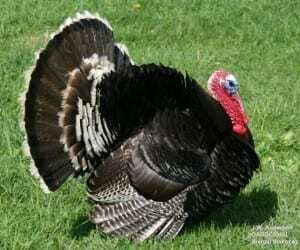 Demand is greater than supply for that locally produced turkey. Again, go to the Department of Agriculture web site above, click on “Connecticut Grown Products” and head to the Poultry and Eggs section. Here you will find listed by county and identified by product (turkey, chicken, eggs, etc.) a poultry producer near you. Again, it is extremely important to order early. I can tell you this from experience. A few years back I had to drive two hours to Sterling, (almost to Rhode Island) to pick up a turkey that was way bigger than I needed; just to get a “local” bird for my Thanksgiving dinner! Now I order in October and don’t have to drive nearly as far. If your holiday meat of choice is the venison you (or a friend) were lucky enough to bring home, just a few food safety notes to keep in mind. The Pennsylvania State University has a great resource for handling deer safely, titled, “Proper Care of Venison from Field to Table.” This publication “contains guidelines and helpful hints to help you ensure that the food you’re providing is safe.” Nothing ruins Thanksgiving like a bout of foodborne illness! We all know that sometimes what makes a holiday meal special is not the main players, but the bit parts: relishes, sauces, condiments and desserts. Use Connecticut eggs in your pies, cream in your whipped cream (beats the spray can any day! ), and butter on your mashed potatoes or in your sweet potato brown sugar glaze. Sweeten your desserts (or sweet potatoes, brussels sprouts, carrots or acorn squash) with local maple syrup. Add spice with locally sourced pickles, relishes or sauces—a good place to find them is your local farm market. Complete your dinner with a locally produced milk, cider, wine or beer. Additional lists on the Connecticut Grown site include those for apple growers, honey producers, maple sugar houses, meat producers, organic farms, and vineyards and wineries. 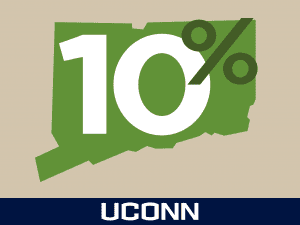 Or, contact the UConn Home and Garden Education Center at ladybug@uconn.edu or 1-877-486-6271 for more information. One of the best things about June in Connecticut is strawberry season. And we have been waiting a long time for strawberry season this year in Connecticut! Most farmers will tell you that the cold spring has delayed picking as much as 2-3 weeks. Even now, the supply is still gearing up. Get to your farmers’ market early in the day if you want to score a box or two. And be sure to check with your favorite pick-your-own (PYO) operation. Some are just starting up this week. “Madame Tallien, a prominent figure at the court of the Emperor Napoleon, was famous for bathing in the juice of fresh strawberries. She used 22 pounds per basin, needless to say, she did not bathe daily. The American Indians were already eating strawberries when the Colonists arrived. The crushed berries were mixed with cornmeal and baked into strawberry bread. After trying this bread, Colonists developed their own version of the recipe and Strawberry Shortcake was created. 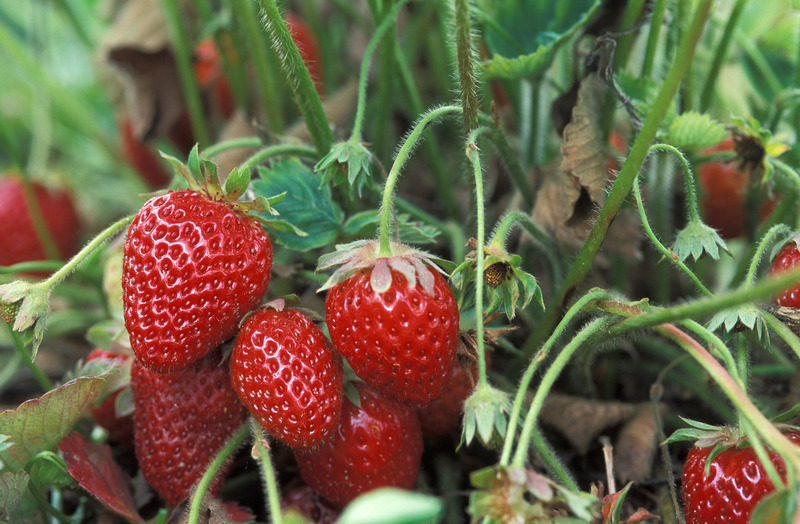 Strawberries are ready to harvest when they are a bright shiny red color. If they are greenish or whitish, leave them on the vine. They will not ripen further after harvesting. It would be a shame to work hard at growing and picking these jewel-like fruits only to have them rot in the fridge or shrivel on the counter. So be sure to treat them well. 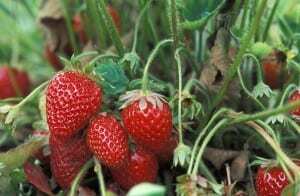 If you are lucky enough to have a strawberry patch in your back yard, or if you plan to visit your local PYO, start by washing your hands, then head out to pick the strawberries. If the PYO operation does not have hand-washing facilities, you can use hand sanitizer as an alternative. Pick berries that are bright red and leave the overripe, mushy or those that are obviously headed in the wrong direction. If you are planning to make jam or jelly, don’t think that you can get by with shoddy, overripe berries—you might end up with shoddy, over-mushy jam. A good rule to follow when it comes to preserving food at home—whether it is canned tomatoes, frozen green beans or strawberry jam: you will never end up with a product that is of better quality than the produce (tomatoes, green beans, strawberries) that you started out with. Refrigerate the berries as soon as you can after picking. This will help with shelf life. Store unwashed berries loosely covered with plastic wrap in the coldest part of your refrigerator for two to three days at most. But, do not wash the berries before refrigerating them. If washed, the berries are more likely to get moldy in your refrigerator. Always wash them before eating, though. To wash, place berries in a colander and rinse under cold running water. Do not allow berries to soak in water—they will lose color, flavor and vitamin C.
or the National Center for Home Food Preservation for canning and freezing information at www.uga.edu/nchfp. 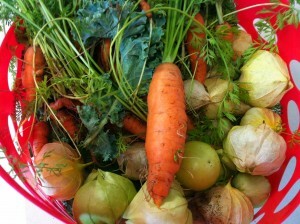 Eat locally grown, even in winter…. After a food-filled holiday season (including, I must confess, raspberries, grown somewhere in South America, in a fruit salad…), it is time that many of us resolve to eat healthier and, perhaps, to attempt to eat more locally grown foods. It sure can be difficult to live with THAT resolution during winter in Connecticut. Eating seasonally can get a bit tedious over the long hard winter if your supply is limited by either amount or variety. But, many farmers are now extending their growing seasons with greenhouses, high tunnels and other production methods. You may find the fruits of their winter labor at a winter farmers’ market near you. Actually, there are 10 of these markets in the state—one is likely not far from you. Included are the Fairfield and New Canaan Farmers’ Markets in Fairfield County; the Hartford Market at Billings Forge in Hartford County; CitySeed’s indoor farmers’ market in New Haven, Madison farmer’s market and Guilford farmers’ markets in New Haven County; Stonington Winter Farmers’ Market in New London County; Coventry, Ellington, and Storrs Winter Farmers’ Markets in Tolland County; and Stonington farmers’ market in New London County. Check with the local market near you for hours, days and times. Some meet only once or twice a month, others continue to be open weekly. Keep in mind that shopping at the farmers’ market in the winter is different than in the summer—or than in a super market in the winter. If it is an outdoor market, it WILL be cold—or there may be snow on the ground. Indoors or out, the food choices will be different. You might find beets, carrots, celeriac/celery root, Jerusalem artichokes, kohlrabi, parsnips, potatoes, radishes, rutabagas, salsify, sweet potatoes, turnips, and winter squash. If you are not familiar with, let’s say, kohlrabi or rutabaga, type the name into your favorite search engine (or leaf through a good general cookbook) and you will be sure to find a tasty recipe or two. You might also discover Belgian endive, broccoli, broccoli raab/rapini, Brussels sprouts, cabbage, cauliflower, celery, chicories, curly endive (frisée), escarole, kale, or radicchio. Hearty leafies like escarole, chicories, endive and radicchio make a great base for a winter salad. Because they have stronger flavors than the usual romaine or ice berg, they make a great base for other seasonal foods. Try escarole or arugula with pears and walnuts. Or try making a cole slaw with red cabbage and shredded kale—it is really delicious with dried cranberries or chunks of fresh apple added. While you’re at it, this might be a good time to splurge a little and buy some locally produced meats, poultry or shellfish. Locally produced animal protein foods may be a bit more expensive, but one taste and you will know that is was worth it. Most farmers’ markets will have these products as well as local artisanal cheeses and other dairy products. Give them a try and you will be hooked. Finally, while not grown locally, citrus fruits are certainly a “seasonal” food. It makes sense to add them to your grocery list at this time of year-even if you know they won’t be found at your local farmers’ market. First of all they provide vitamin C and other nutrients that might be difficult to find in a limited seasonal diet. Look for those grown in the US, including Texas, Florida, Arizona and California, if that will make you feel better (local can be defined as you see fit, here!). Sliced oranges are great in winter salads made of a mixture of radicchio, escarole and endive. The sweetness of the oranges offsets the bitterness of the greens. Finish with some balsamic vinegar and a little olive oil. You can also use dried cherries or cranberries in this salad along with some walnuts or pecans.